My husband is not a big fan of Bollywood movies hence I was surprised when he told me that he wanted to watch 'Citylights' instead of 'X-Men'. I was intrigued by the trailers too because anything off beat immediately catches my fancy. 'Citylights' apparently is the official remake of a Phillipines movie 'Metro Manila', a movie which I had never heard of. I hadn't watched 'Shahid' either, but I knew that Rajkummar Rao is a fantastic actor. Extremely underrated though. While everyone was praising Kangana's acting abilities in 'Queen', no one noticed the restrained acting by Rajkummar Rao. He was brilliant in the movie; his attitude, the loser look and the loss in his eyes. For him and for the praise Hansal Mehta received for 'Shahid', I decided to watch the movie. Deepak Singh (Rajkummar Rao) and his wife Rakhi (Patraleka) live along with their daughter Mahi in Rajastan, where Deepak owns a small cloth shop which is the only source of their survival. As expected, he loses the shop to debt and along with his family decide to come to Mumbai, to make a living. Rakhi is against it at first but Deepak manages to convince her, saying that they can take the help of Omkar, his friend who is a driver of a badi gaadi in Mumbai. Yes, the naivete here is heart wrenching. The family comes to Mumbai and looks around for Omkar who is never to be seen. Soon, they are tricked in the promise of a house and lose their sole savings of ten grand. The scene where Rakhi and Mahi are thrown out of the house, the scene where the family spends a night on a footpath, next to a dustbin broke something within me. Thanks to a bar dancer, they find an under construction building to stay in and Deepak sets out in search of a job. It is disturbing to see him return everyday without a job and with a packet of three buns. While Deepak is struggling to provide, Rakhi takes up a job as a bar dancer to support the family. Her audition scene had me in tears as she slowly gyrates to the cheap music being played. The scene in which she discloses her newly found job to her husband is one of the best scenes of the movie. Both of them sitting in separate ends of the frame crouched in their own arms crying their hearts out. Wow, what a beauty it was! Equally poignant. Soon, Deepak finds a job in a security firm under the guidance of Vishnu Sir aka Manav Kaul, who dazzles in a sharp act. Deepak and Vishnu become partners and soon Deepak is entangled in a web of deceit. The poverty and helplessness wins through and Deepak is soon forced to resort to weapons for the survival of his family. What happens next is totally unpredictable and unexpected. A special mention to the enchanting music that appears in intervals. "Soney do, khwaab bune do.." by Arijit Singh is as haunting as beautiful it is. Deepak's innocence moved me to dangerous extents, which is even used as a line in the movie where Vishnu tells him "Aap itni dheemi gati ke film hain!". His posture, the helplessness, the tears, the silence, he aces it all. Patraleka as Rakhi is endearing and balances the act perfectly. She is stunning and it is hard to believe that this is her first film, especially in the scene where she is confronted by her drunken husband. Manav Kaul who was more than impressive in 'Kai Po Che', shines here too. He plays the role of a frenemy to the tee. The ease in his dialogues is enchanting. But in the end, the city wins. Mumbai, the city of dreams which is known to swallow people and spit them out elsewhere, does just that. Drowning the poor in darkness and dazzling the rich with its lights. Yeah, Citylights it is. 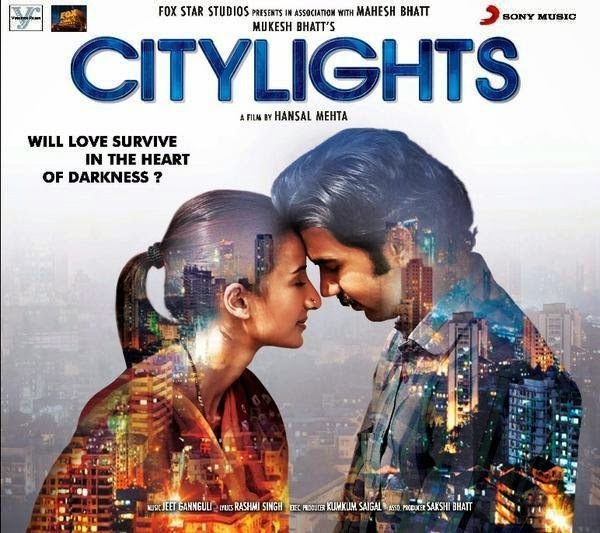 Verdict: Although the concept is tried before, 'Citylights' stands out on its own. It sure is not a typical commercial movie, but it has its heart in the right place. I have lined up movies...gosh so much work !! just when u think how much more can one still write about Mumbai and its saga, u have one stroke of brilliance like this, and u know, that saga is endless! Oh sure it is. Very few movies are worth watching when made about the most talked about city in India. This one sure is one of them. Oh yes he is. Do not miss this one. Never been much of a Bollywood fan but your review makes me want to see it! Watch this, you will not be disappointed. I agree on that. Movies without superstars are really good. Watch it though, its soulful! You have no idea I have been waiting for this movie for how long! Its still not out here in Malaysia but i am keeping my fingers crossed. I watched Kai Po Che yesterday and before that I had watched Shahid, and i can easily say that i am in love with Rajkumar Rao! He is the future of Hindi Cinema without any doubt. After watching him in Shahid, something just tinged inside me telling why he is not someone everyone knows about? I specially am grateful to Mahesh Bhatt for mentioning his name on Kofee with Karan, i would'nt have come across him elsewise. I am tying so many hopes to this movie! And yes, Sonay Do is hauntingly beautiful! So is Muskarane ki Wajja. You should listen to Kai Po Che tracks too and probably watch it as well. It one dreamy ride! I have watched it and love the songs as well. This one is much much better and yes, Rajkummar is a fantastic actor indeed. Its a treat to watch him onscreen.